4 flat Succulents about 3.5 inches Diam. This is a modern, asymmetrical arrangement with white tulips, Bear Grass, and succulents that uses shape, texture and color to achieve balance. The tall Bear Grass arches repeat - one high and one low - to balance the flowers and mirror the succulents' roundness. While the main focal point, the tulips, sweep gently to the right, the adjacent succulents repeat a circular shape in the middle of the left portion of the arrangement and serve as a secondary focal point. Finally, the various curvatures are offset by horizontal lines formed by the the vase's top edge and base, and at the mid point by the more subtle water line. The arrangement has a neutral pallet of greens, whites, and beige. This arrangement looks super simple, but requires care executing. You can buy a vase like this (click here) If you have your vase, tulips, grass, and succulents, let's begin. Use 4 bags of gravel like this or aquarium sand. Fill stones over half way up vase except have gravel lower where tulips will go. 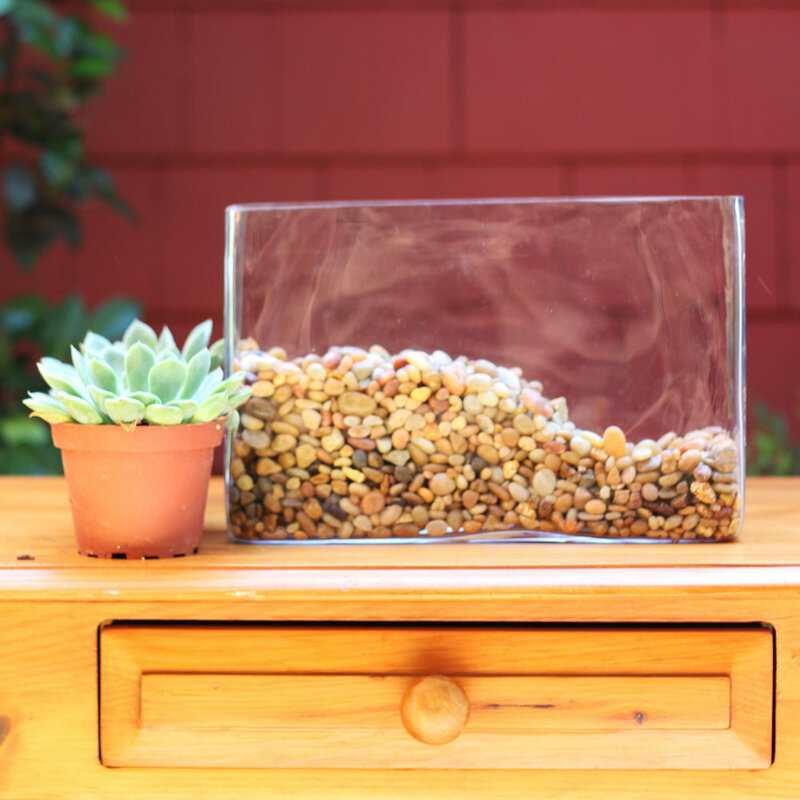 Fill water to top of gravel. Pinch side of plastic pot and squeeze soil up to pop succulent out. Carefully tap dirt off roots. Use hose to remove the rest of the dirt from the roots. Trim root close to succulent. Repeat process with other succulents. Trim root close to succulent. Repeat process with other succulents. Hold 2 succulents with roots together and gently slide in. Repeat with other two succulents. Place first set of succulents close to edge. Place other set of succulents next to it. Trim a little off grass. Clauss shears work best for this. Don't get a 'papercut' from the grass. Put small beige rubber band around bottom and end of grass. Push to end. Push ends of grass down with a chopstick. Low arch goes from 2nd succulent to corner. 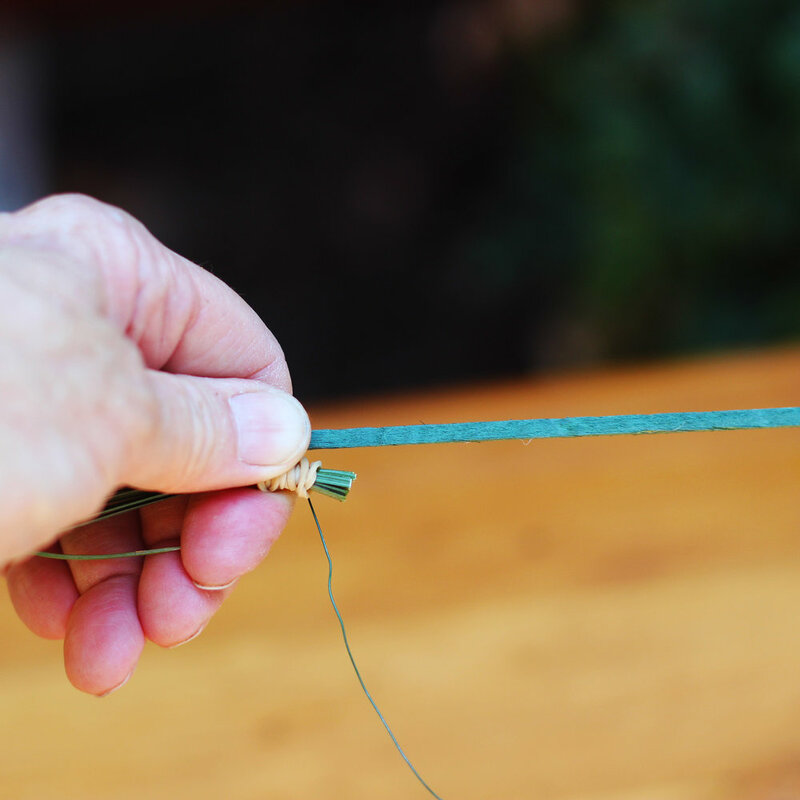 Use longest strands of grass to make second bunch. Wire smallest end onto 6 inch pic. Push pic down into far corner. Like so. Should be higher than 1st arc. Cut your tulips at about 14 inches and insert on the side. Here's the view from the side.